Australia’s Great Beach Drive has been launched to provide over 200 kilometres of spectacular beach driving, capturing the dramatic coastline, scenery and wildlife along Queensland’s Sunshine and Fraser coasts. The touring route is steeped in culture and etched in Australian history. The full journey covers two UNESCO Biosphere Reserves, a Wold Heritage-listed Marine Park and the largest sand island in the world. Australia’s Nature Coast, which has been established by the Sunshine and Fraser Coast tourism organisations to jointly market their regions, has put together an itinerary involving six drives covering the region, which can be tailored to meet the specific interests and time span of each individual visitor. The new product provides full details of self-drive 4WD options or guided tours across the region. 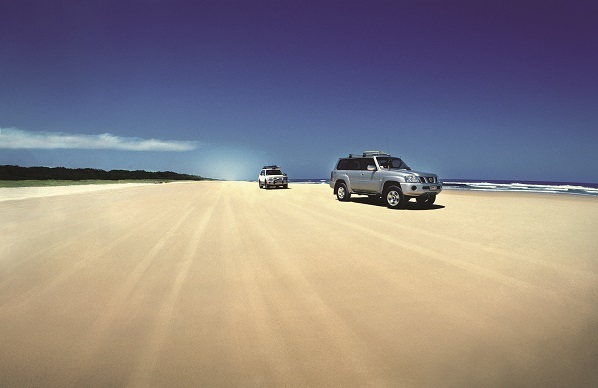 While subject to tidal and weather conditions, the Great Beach Drive is suitable for most experienced off-road drivers and the sections or the entire route can be covered in anything from half a day, a long weekend to a full week, depending on the level of activities undertaken during the drive. The drive starts in Noosa on the Sunshine Coast, where travellers can complement the sophisticated lifestyle of the beachside village with a kayak, canoe or cruise of the Noosa Everglades. They can then take to their four wheel drive for a trek on the ‘beach highway’ to Rainbow Beach, along which travellers will have the chance to see abundant wildlife including whales, dolphins, birds of prey, kangaroos and monitor lizards. Rainbow Beach is an ideal base for adventure lovers to paraglide, hang-glide, sky dive, surf, and fish or take a horse-ride along the beach. There is diving at Wolf Rock and Double Island Point offers the world’s longest right-hand surfing break and a historic 1884 lighthouse. Fraser Island is accessed by ferry and offers a feast of 4WD routes as well as water and other adventure sports, along with Australia’s native dingo. Back on the mainland Hervey Bay offers cosmopolitan dining, shopping and accommodation, and plenty of opportunity to explore the sheltered waters for sailing, fishing and water sports. The north point of the Great Beach Drive is the historic city of Maryborough. The beautifully preserved colonial streets were home to the creator of Mary Poppins, and visitors can follow in her footsteps on the Magical Mary Trail. The way back to the Sunshine Coast takes in Tin Can Bay, where the calm waters provide the perfect opportunity for sailing, swimming, fishing and a rare opportunity at Barnacles Dolphin Centre to interact with wild Indo-Pacific Humpback dolphins. The sleepy little village of Tin Can Bay is a renowned fishing port, best known for its prawns. The name derives from the Indigenous word ‘Tuncanbar’, thought to refer to the dugongs that frequent the Great Sandy Strait, a pristine waterway where visitors can sail, rent houseboats, fish or swim. Visitors can return to Sunshine Coast Airport or Brisbane via the gold rush town of Gympie and market towns of Eumundi and Cooroy. Commenting on the launch of the Great Beach Drive, Sunshine Coast Destination chief executive, Simon Ambrose, said that the drive would inspire both international and domestic travellers.